April 07, 2019 at 7:29 pm. 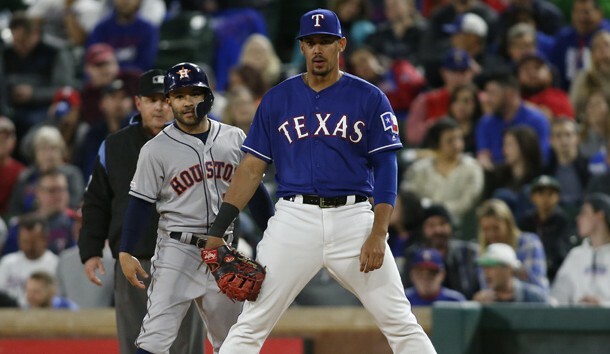 Texas Rangers first baseman Ronald Guzman will miss three to four weeks with a right hamstring injury, manager Chris Woodward told reporters on Sunday. Guzman was diagnosed with a Grade 2 strain and was placed on the injured list prior to Sunday’s game against the Los Angeles Angels. He suffered the injury while running out a double during the third inning of Saturday’s game. Guzman, 24, is batting .231 with two homers and four RBIs in nine games this season. He batted .235 with 16 homers and 58 RBIs in 123 games last season as a rookie. Texas recalled infielder Patrick Wisdom from Triple-A Nashville. Wisdom, 27, was 3-for-12 with one homer and four RBIs. Wisdom batted .260 with four homers and 10 RBIs in 32 games with the St. Louis Cardinals last season. Woodward said Wisdom and infielder Logan Forsythe will split first-base duties until Guzman returns.